Well, it’s hard to believe it’s that time again. The last week of CSA. What an unusual season it was from a weather standpoint. Too wet. Then to dry. Then to smokey. And now it’s just perfect. Throughout all that, I hope that you enjoyed your food journey through the farm season. There were more than a few times this season that people at market asked us what state we trucked in the produce from, and they are always amazed to hear “5 miles west of Whitefish”! I think for a lot of folks, they don’t realize what our land is capable of producing with a little effort. Alright, a lot of effort. But what’s more comforting and enjoyable than knowing where your food comes from, how it’s grown, and how it get’s to your plate. And thanks to all of you for taking a chance with us and going on this journey with us. How you choose to spend your money really does have an effect on what the world looks like, and you should be proud that you are supporting a world that has small farms. 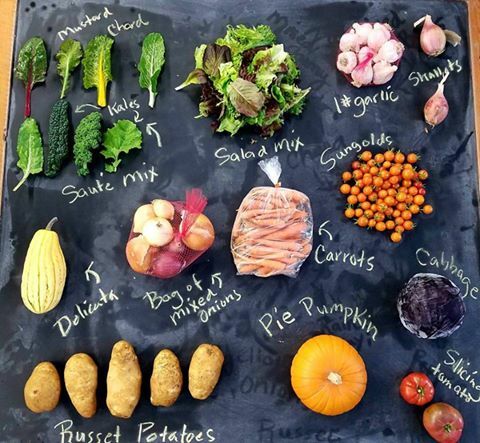 This week’s share is a bit larger than most weeks, so maybe bring an extra bag to pickup. The prolific Sungold tomato has made it from a mid-July arrival to a late-September exit, which has to be a new record for us regarding tomatoes. There is a healthy portion of onions, garlic and potatoes to hold you over for a little while, as well as some carrots and the fan-favorite Delicata Winter Squash. Cut the Delicate in half, scoop out the seeds and then either bake, or slice it up and cook it on the stove top. It is the only winter squash where you can eat the rind and all….we call it the Montana Sweet Potato. Here’s a classic recipe. And for those of you who are craving a pie to go with all this fall weather, you will be receiving a Pie Pumpkin. 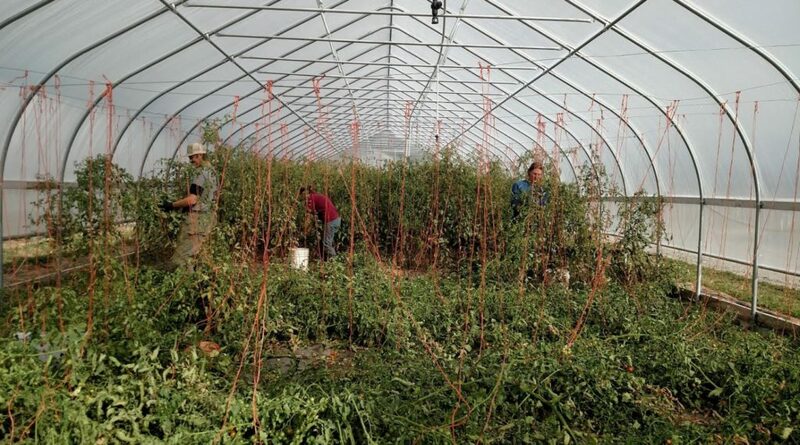 Deconstructing the Sungold Forest…a sure sign the season is winding down. For anyone interested in additional food for the fall, we will have a lot of pre-bagged “grab and go” items at all of the Farmer’s Markets (Whitefish, Columbia Falls, and Kalispell) this week. And our 2nd annual Stock Up Sale will be at the farm on October 5th from 4:30 until dark (See last week’s newsletter for the poster with all the details). There have been lots of inquiries about carrots, and what happened to the big, sweet carrots that we had all summer. Unfortunately, the first four plantings did great this season, but the last large storage plantings fell victim to Asters Yellow. This is a plant disease that is spread by biting insects, and it makes the carrots long and skinny, hairy, and bitter. And this was most likely a result of the hot summer bolstering the insect populations this season. It didn’t affect all the carrots, but the carrots that we did harvest and have bagged are not the typical “Two Bear” Carrots you all know and love. They are still good carrots, just not quite the same. So, we wanted you all to know that upfront. We even had a positive comment this week from a customer who loves the smaller carrots as the has been roasting them whole in the oven and says they are delicious. Storage carrots aside, it’s been a great year! Certainly challenging in many ways, but in the end, I think our 10th year turned out to be a good one. It’s now time for us to shift gears a bit and start working on all the many projects we have planned to make the farm even better for next year. And yes, there will be a little rest and recuperation thrown in as well. Thank you again for all your support, and we look forward to seeing you at the last CSA of the season! Good job! Loved the pictures and the chance to “walk” the journey with you.